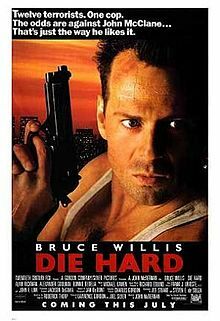 With the 25th anniversary of the movie “Die Hard,” the recent release of a new sequel and the release of a new DVD set containing the original and all the previous sequels, a lot of people are writing about the 1988 original and how great it was. 1) I think it’s arguably the best action film of all time. Sometimes I consider all action films that came after it to be redundant. 2) As far as I’m concerned, there is no “Die Hard franchise.” There’s the original movie — end of story. I saw the first sequel, “Die Hard 2: Die Harder,” wasn’t impressed, and haven’t bothered with any of the others. The WHOLE POINT of the first movie is that John McClane isn’t a super-powered operative who routinely gets in epic adventures, but a regular guy who found himself in the wrong place at the wrong time. So I’m writing as if the sequels didn’t happen. Which they shouldn’t have in the first place. Anyway, it’s easy to think of it as JUST an action movie. It hits all the beats. The explosions. The fist fights. The catchphrases. But I’ve got a couple of other interpretations. A while ago, I did a review of Richard Fellinger’s excellent short story collection “They Hover Over Us” from Snake Nation Press (available on Kindle and all other e-readers). If you read this blog regularly, you’ll know I’m more partial to genre fiction than the kind of literary fiction that Mr. Fellinger writes. But these stories of regular folks in Rust Belt Pennsylvania really impressed me. You can see the review here. Where do you live and what’s your full-time job? Did you say full-time job? I’m a writer, which means I piece together jobs that aren’t quite full-time, or at least don’t pay full-time. I work at Elizabethtown College in two roles–I’m an adjunct writing professor and writing fellow in charge of the college’s Writing Wing. How did you get into writing in the first place? I was a newspaper reporter for about 15 years, and later in my newspaper career I began penning short stories and enrolled in the MFA program for creative writing at Wilkes University, which is a terrific program, by the way. Was there any particular reason why you gravitated toward short stories? Well, my first book was a collection of short stories, but I’ve been working on a novel for the past three-plus years, so I don’t gravitate toward short stories any more. Part of the reason I did, I think, was because as a journalist, my mind was trained in shorter mediums. Where do you get ideas for stories? Anywhere. A lot come from personal experience. My short story collection is entirely about people from the Pennsylvania Rust Belt, where I grew up, so that area was a big influence on me. My novel is set in a fictional Central PA town, where I live now. My fictional town is tidy, small and gossipy, a lot like my new home. Raymond Carver was a big influence on me when I was younger, but as I matured I made an effort to be less of a minimalist, and writers like Tobias Wolfe and Richard Ford have been big influences on me lately. As a writer, how much of your own marketing are you obliged to do? In my case so far, almost all of it. My short story collection was published by a small literary press that publishes the winner of a literary fiction award called the Serena McDonald Kennedy Award, so it seems most of their effort goes into the award and they hand off all of the marketing to the writer. It’s a challenge, to put it mildly. A lot of writers I interview for this blog do genre fiction. The advantage for them, it seems to me, is that the readership tends to be relatively easy to identify and reach. As a writer of literary – as opposed to genre – fiction, how do you identify potential readers and persuade them to read your book? I don’t think a writer of literary fiction worries too much about identifying readers. When I was in grad school, for instance, some faculty members discouraged me from writing short stories because they’re hard to sell. And that’s true, believe me. But I think we plow ahead with our stories because we feel like they’re inside us waiting to come out, and we feel a need to write them regardless of commercial value. Hi folks. This is God. That was a lightning bolt. You’re welcome. Are you one of those people who’s been working on a novel for the past 20 years, and you’re almost up to Chapter 4? Be forewarned. The next sentence may make you want to kick yourself. 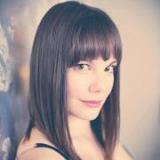 At 30, Jessica McHugh has 12 books published. So quit making excuses and start writing! Actually, before you do that, read her novel “Pins” – a thoughtful coming-of-age story masquerading as a sordid thriller about a crazed killer offing strippers. I reviewed it here. Also, before you dive back in on your own novel, you might want to read the following interview with Jessica. Maybe you’ll be inspired. You’re how old? And you have how many books published? I’m 30 years old, (when I say that, I hear Natalie Wood from “West Side Story” desperate praying “Please let it not be true!”) and I’ve had 12 books published by indie presses in the past 4 years. How do you manage to get so much writing done? If you read my book reviews, you may notice that they’re overwhelmingly positive. And you may think to yourself: Does this guy like every freakin thing he reads? The answer is an emphatic “No.” More on that in a second. You may also notice that most of the books I review are relatively obscure. They tend to be volumes from small, independent publishers that aren’t likely to get reviewed elsewhere. I just tried to do a Google search (always an excellent way of getting accurate and precise information) to find out the number of new books published every day. A lot of online sources are using the number 1,500. I don’t know if that’s true or not. Let’s just say that a buttload of new books are coming out all the time. One day, a college professor was addressing his class. “But I didn’t say anything yet,” the professor protested. “Aren’t you assuming …” the professor began, but the young man cut him off once again. “I don’t know,” the professor said. And the name of that young man … was George Washington. PLEASE FORWARD THIS IF YOU LOVE AMERICA!!!!!!!!!! Today Punxsutawney Phil predicted that the skies will rain fire and blood and a Beast will rise, bringing about the end times. I think he’s starting to take himself a little too seriously.